Believer Kids Keyboard Program (Level ll) is an important module that will continue to strengthen and build upon the foundational rhythms learnt in Level l. The introduction to fill-ins and added application of enhanced chords will thrill both player and listener alike. The thematic focus of the Journey to the Promised Land (Part ll) challenges us to follow God’s direction closely to fulfill our destiny just as the Israelites were led into the Promised Land. 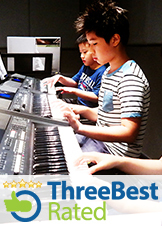 Our main objective is to equip your child to play confidently on the keyboard. We will introduce students to contemporary chords & rhythms to achieve a wider range of sounds used in current praise and worship songs emerging today. They will also get the opportunity to explore new avenues of expression by adding fills to generate more activity into their playing. While all our students are graded weekly, the Believer Kids Keyboard Program has been designed as a light-hearted, pressure-free environment for children to learn in. Keyboard students normally do not take music grade examinations. However, we do adopt methods of providing incentives and targets to keep students motivated right up till the advanced courses.